Victor has some really unique ideas and I feel really fortunate I get to be the one to do his tattoos. 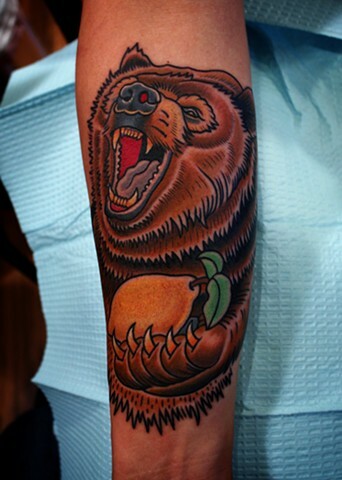 This bear tattoo is the just one of the many upcoming projects I have with him. This style is something I've been working on for quite some time, and it's always fun to do work like this. If tattoos were literature, I feel like traditional or neo-traditional tattoo styles would be like writing poetry, while realistic tattoos would be like writing non-fiction. Both have their challenges and can be done artistically, but the process and formats are completely different. With realistic tattoos I am basically processing information from an existing subject and transferring it in an accurate way. With traditional tattoos I have to fight the urge to do too much, I need to show restraint and keep only the essential elements in order to portray the subject in an artistic way. I noticed the similarity to literature, a good non-fiction novel tells an existing story accurately with tons of detail and some exaggerations to enhance the reader's experience. Poetry delivers the writer's idea/message/story/theme with far fewer words, yet each word that is used has great importance. Hope this didn't sound too analytical or confusing, just something I was thinking about while I was doing this tattoo. Either way, tattooing is friggin' hard to do no matter what style it's done in. I feel like I'm making progress every day though.